OilSoup: Oilers vs Jets: The Rivalry Continues! Oilers vs Jets: The Rivalry Continues! Yes it's been a long time in the waiting. After a long 15 years, the two teams met Monday night in what turned out to be a great game. MTS Arena was rocking with a playoff atmosphere all night long. Both teams came out flying and for the first ten minutes it was vintage firewagon hockey. The coaches eventually pulled the reins but the game still had a high flying tempo. The Oilers played catch up hockey until the third period when they finally took the lead. The Oilers never looked back and won the game 5-2. It was a nostalgic night, a night that I've been looking forward to since that memorable Tuesday in May. The Oilers and the Jets belong to be together in the NHL, for what I feel is the best rivalry the Oilers have. Yes we have the Battle of Alberta but we also have a cornball history with the Jets. Our fair two cities are so very similar. We have our civic pride. We have shared our ups and downs. We are the forgotten brother and sister. And we have our passion for hockey. 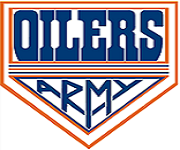 Ever since the defunct WHA, the Oilers and the Jets have battled tooth and nail. There is the history of hate and mutual respect . So many games that have mattered so much. A part of Oiler history is their battles with Jets (anyone else remember Gretzky versus Hawerchuk, Kurri versus Steen?). When the Oilers were at their best, so were the Winnipeg Jets. Was it coincidence that when the Jets left town, so did the Oilers? Fourteen out of the last Fifteen years the Oilers have been a wishful pretender, never a contender. A shadow of it's past. And now the Jets have returned and so have the Oilers. Oh how the hockey Gods favour us. Once again, the two teams are about to start a momentous journey together. The return of the Jets and the the Oilers strike first! Absolutely agree, hopefully next year they'll play each other more than once.